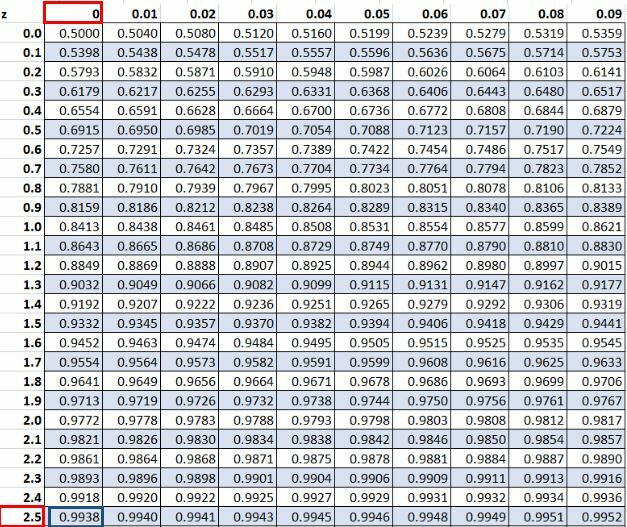 where X is the value we are analyzing, μ is the mean, and σ is the standard deviation. 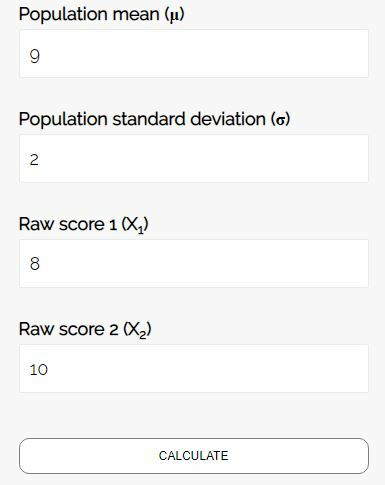 In statistics, we can use z-scores to answer questions about percentages. 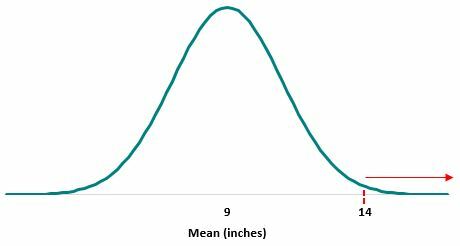 Example: Suppose the height of plants in a certain garden is normally distributed with a mean of μ = 9 inches and a standard deviation of σ = 2 inches. Approximately what percentage of plants in this garden are taller than 14 inches? Step 1: Find the z-score. Step 2: Since we want to know what percentage of plants are taller than 14 inches, we want to know what percentage of plants lie to the right of 14 inches on the normal curve. 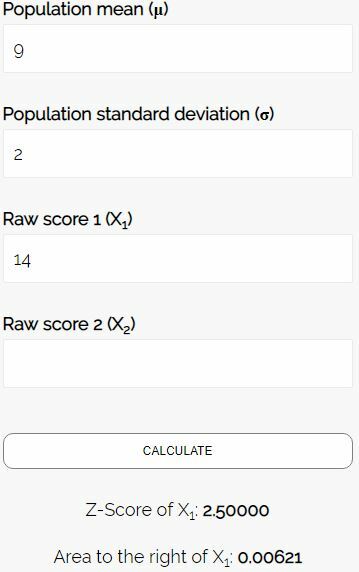 We can either use a z table or a z-score area calculator to find the area under the curve greater than a z-score of 2.5. 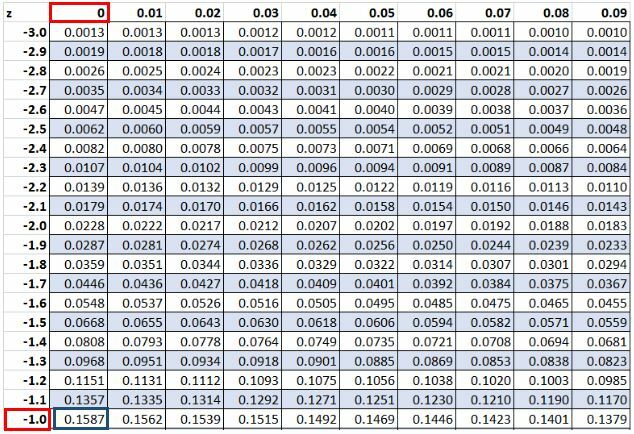 A z table tells us the area under the normal curve to the left of a particular z-score. In this case, we see that the area to the left of a z-score of 2.5 is 0.9938. The area to the right of this z-score would simply be 1 – 0.9938 = 0.0062. This means that approximately 0.62% of the plants in this garden are taller than 14 inches. This gives us the same answer: the area to the right of 14 is about 0.0062. Thus, 0.62% of the plants in this garden are taller than 14 inches. Approximately what percentage of plants in this garden are shorter than 9 inches? Recall that the mean height of plants in this garden is μ = 9 inches. And recall that in a normal distribution, half of the data lies to the left of the mean and half lies to the right. This means that approximately 50% of the plants in this garden are shorter than 9 inches. Approximately what percentage of plants in this garden are shorter than 7 inches? 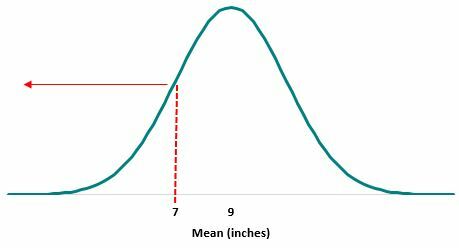 Step 2: Since we want to know what percentage of plants are shorter than 7 inches, we want to know what percentage of plants lie to the left of 7 inches on the normal curve. This means that approximately 15.87% of plants in this garden are shorter than 7 inches. This gives us the same answer: the area to the left of 7 is 0.15866, which rounds to 0.1587. Thus, 15.87% of the plants in this garden are taller than 14 inches. Approximately what percentage of plants in this garden have a height between 8 and 10 inches? 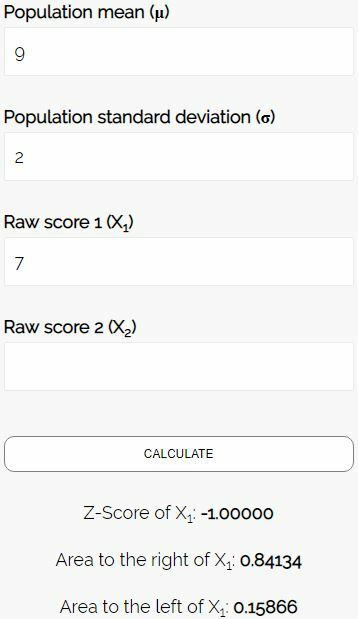 Since we are analyzing two values, the calculator approach is much faster. We simply enter the mean (9), the standard deviation (2), the first value we are interested in (8), and the second value we are interested in (10). The area between the values 8 and 10 is 0.38292. This means that 38.29% of plants in this garden have a height between 8 and 10 inches. 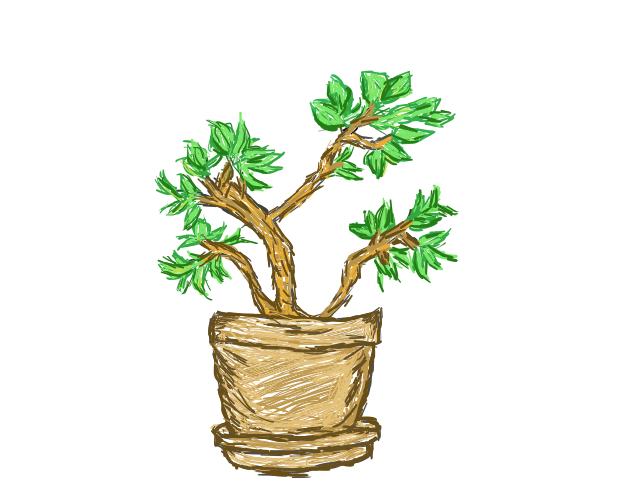 How tall would a plant need to be in order to be taller than 95% of all other plants? 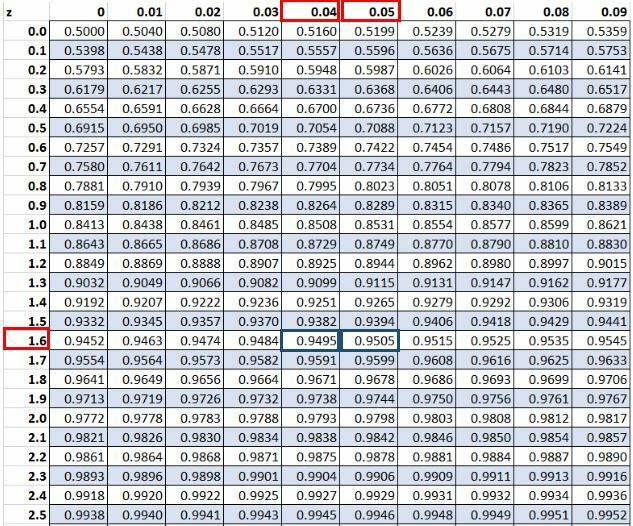 Step 1: Use the z-table to find the z-score that has an area to the left of it of 95%. The two z-scores are 1.64 and 1.65. In this case, we can take the average of the two: 1.645. Step 2: Plug this number into the z-score formula and solve for X. A plant needs to be at least 12.29 inches tall to be taller than 95% of all the other plants in this garden.